The spirits were high in the Indian camp as the visitors wrapped up the 5th match One-Day series against New Zealand by 35 runs. They had already won the series after registering comfortable victories in the opening three games but slipped in the fourth ODI where they bowled out for just 92 runs. What would have pleased India even more would have been the fact that it was not the usual suspects Shikhar Dhawan, Rohit Sharma and MS Dhoni performing well but the today likes of Ambati Rayudu, Vijay Shankar and Hardik Pandya. After being reduced to 18/4, India came back emphatically with the middle-order leading them to 252. 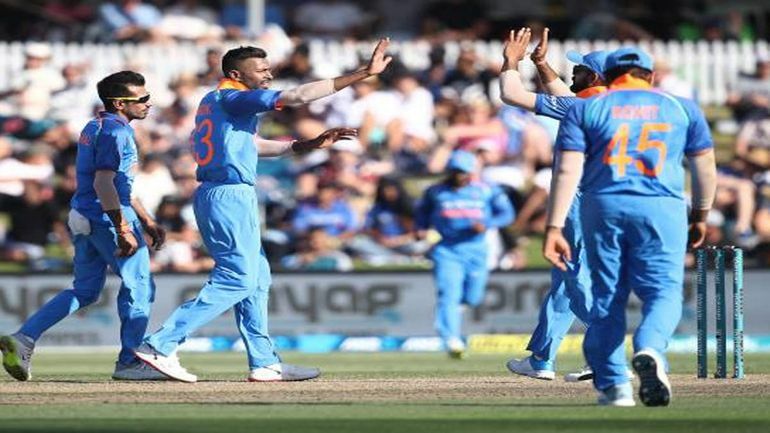 India recovered from 18/4 to score 252 runs with the help of Ambati Rayudu’s 90 runs and a quick fire 45 runs by Hardik Pandya towards the end. Rayudu and Vijay Shankar shared a 98-run partnership for the 5th wicket. The bowlers then restricted the hosts to 217 runs with Yuzvendra Chahal returning with 3/41 as India took the series 4-1. 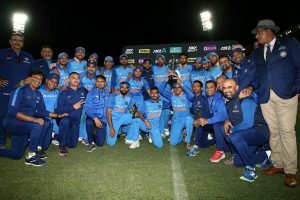 India defeated New Zealand by 35 runs in the 5th and final ODI at the Westpac stadium in Wellington to win the ODI series 4-1. The hosts were pack out in 217 runs in 44.1 overs. The early strikes by Mohammed Shami helped India take control early in the match. Hardik Pandya then removed Ross Taylor when the scoreboard read 38/3. Kane Williamson and Tom Latham then put up a fighting 67-run partnership for the 4th wicket. Williamson was dismissed for 39 runs in 73 balls by Kedar Jadhav. Following the quick dismissals of Williamson and Latham, it was James Neesham who looked dangerous to take the game away from India’s grasp. But it was a brilliant presence of mind by wicket-keeper MS Dhoni who inflicted a run out after an LBW appeal against Neesham was turned down by the umpire. Following the wicket of Neesham, the New Zealand tailenders failed to add much to the total. New Zealand falters in its chase and lost wickets at regular intervals. For New Zealand, Williamson (39), Latham (37) and Neesham (44) are able to put up some resistance. Yuzvendra Chahal took 3 wickets while Shami and Pandya took 2 wickets each. Ambati Rayudu wins man of the match award.